CLAYTON, Mo.—As the grand jury decision in the case of Police Officer Darren Wilson nears, St. Louis Mayor Francis Slay said officials are ready for whatever may come. “For the past 100 days…[we’ve] been engaged in many conversations,” said Slay at a press conference late Friday afternoon. He added that the Unified Command, which is the joint group of local, county, and state law enforcement officials that will be in charge after the grand jury decision is announced, has been preparing for likely protests. “We believe it would be imprudent to not to plan for protests,” he said. Wilson shot and killed Michael Brown, an unarmed 18-year-old boy, in early August. Brown’s death sparked months of protests and outrage from the St. Louis community, and many here have expressed their desire to see Wilson not only indicted over Brown’s death, but arrested. 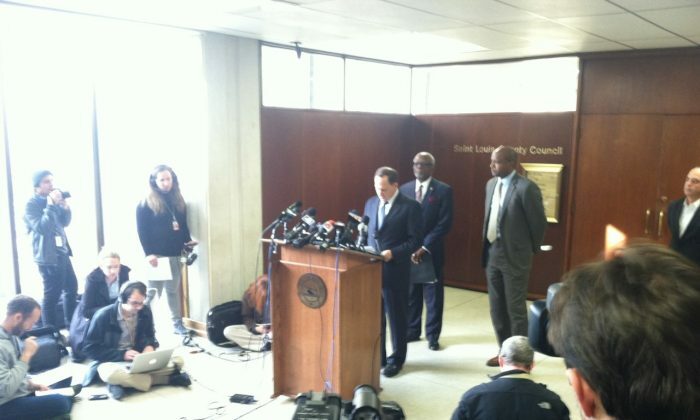 Mayor Slay, who was joined at the press conference by Saint Louis County Executive Charlie Dooley and a representative for Governor Jay Nixon, said that they do not know when the decision will come out, but they expect it soon. Both Slay and Dooley said that a list of “proposed rules of engagement” presented by some community activists has been carefully considered by officials. Slay has consistently referred to the list as the “proposed rules of conduct,” insisting that the word engagement is too militant. The final list, with noted stances of the Unified Command in brackets at the end of each rule, was publicly distributed in its final form on Friday. References by Unified Command to the “coalition” refers to community activists who engaged in dialogue with city, county, and law enforcement officials over the past 100 days. Police will be instructed to be tolerant of more minor lawbreaking (such as thrown water bottles) when deciding whether to escalate the use of force. (Unified Command believes that actions that threaten public safety should be discouraged and arrests will be made with appropriate). Excessive force and other forms of police misconduct will not be tolerated. (Unified Command agrees and encourages coalition to renounce violence and aggressive acts towards Police Officers and citizens). Intimidation and harassment of protesters will not be tolerated. This includes pretextual pedestrian or traffic stops, contacting of employers or family members, pre-emptive arrests or detention of “leaders,” publishing of private information and any other means of intimidation and harassment. (Unified Command believes that the Coalition should renounce harassment of police officers and release of personal information by protesters).